Mark Zuckerberg was full of enthusiasm yesterday for his company’s latest development, “Graph Search“. But he wasn’t the only one who was excited – all across the web there was plenty of “live blogging” from the “packed” press event where Facebook was announcing its latest plans. The Facebook-philes, of course, loved it; high praise was heaped upon the company for coming up with a “Google killer”. It is no such thing – as many expert pundits said after the launch which also preceded a 3% fall in the company’s stock price. At face value this is nothing more than Facebook attempting to provide a service by delving into its data but only doing so with high privacy levels as default. In other words it probably will not tell you anything you don’t already know. And even if it does, there are probably better ways of getting the information. For instance, according to Facebook it will tell you what restaurants your friends in San Francisco like. Great. If I had friends in San Francisco and I needed to know what restaurants they liked there’s a really easy way of finding that out – I’d ask them. Equally, the fanfare launch of Facebook Graph Search reckons we’ll be able to find out what music our friends like. Whoopee-doo…! Again, that’s information I either already know, or I can ask them directly. Facebook appears to have launched a solution to a non-existent problem. And that’s a fairly typical response of businesses in difficulty. Here’s the problem – Facebook simply has to provide much greater financial returns for its investors. So far it is not really doing as well as many might expect, in spite of earning billions in revenue. The real value inside Facebook is in the massive amount of data it has on its 1bn users. But the problem is that those users are so privacy-aware that delving into that personal data and using it is largely a non-starter. Already Facebook appears to be at the “peak of inflated expectations” which according to The Gartner Hype Cycle is where a technology reaches it’s tipping point before people start to dislike it. Already in the UK Facebook has lost 600,000 users within the space of a month. So, just at the time Facebook needs to make more profit it is losing users who are increasingly becoming privacy-concerned. In that business environment the bosses of Facebook are likely to want anything to help them. 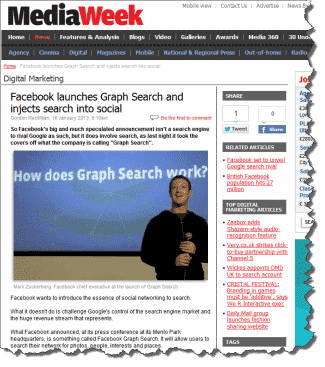 And that’s what Facebook Graph – on first looks – appears to be: a fantastic piece of technology, doubtless, but something which many users will not actually need. The crucial question for Facebook and its investors is whether the proportion of people who will inevitably use Graph Search will generate enough profit. Note: I am happy to admit I may be wrong as my thoughts are based only on the initial media coverage of Graph Search and not of any use of the tool. Once it is available I will do a proper analysis and review. Which Web Browser is The Best? I thought the same, Graham. I was distinctly unimpressed by this “news”. What’s the difference between this and asking your mates what they like? More importantly, most people don’t fill out their Facebook profile with their interests, so there’ll be very little data to search.